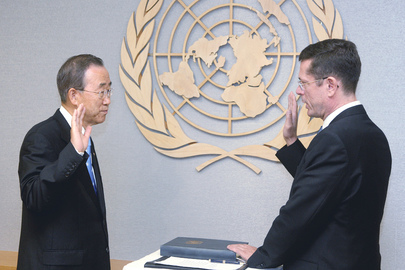 UNITED NATIONS, July 28 -- The UN's report on war crimes in Southern Kordofan, including inaction by UN peacekeepers, won't be released until “the first days of August,” Inner City Press was told Thursday by Ivan Simonovic, the New York representative of UN High Commissioner for Human Rights Navi Pillay. Thirteen days ago, Simonovic said it would be released in two weeks. After that, Inner City Press put a copy of it online, here. Still the UN calls it a “leaked” report that is being edited. 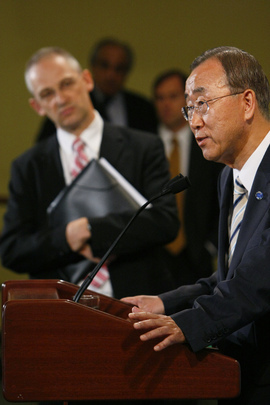 Will the portions critical of UNMIS peacekeepers be excised? Simonovic also told Inner City Press he asked the Security Council for support of visa request for civilian supporters of the new UNISFA force of Ethiopian soldiers in Abyei. Meanwhile a Sudanese diplomat praised Simonovic to Inner City Press, quoting Simonovic as saying he "has no mandate" in Southern Kordofan. An unresolved question is who in the UN would be held responsible for inaction by UN peacekeepers in Abyei and then Southern Kordofan. A day after former UNMIS force commander Moses Obi refused to answer questions referred to him by the Department of Peacekeeping Operations, the overall UN spokesman Martin Nesirky told Inner City Press “you've made your point on camera” and declined to say who was responsible for the former UNMIS. It is often said that armies should hold commanding officers responsible after the fact. But the UN seems to be saying that once a peacekeeping mission expires, no one speaks for it anymore, and by implication, no one is responsible. This is a question that Simonovic should answer, as well as a question Inner City Press asked at Thursday's noon briefing with Nesirky, for the UN's response to Southern Kordofan's governor (and ICC indictee) Ahmed Haroun admitting moving and mass-burying corpses. Mr. Simonovic will make himself available and address it, Nesirky said. So we'll be waiting - watch this site.